I have spoken at length—some would say whined at length—about how I dropped the ball on all of my foodish habits after I started law school. Baking fell by the wayside, weekly trips to the farmer’s market always included buying bread so that Lloyd could have toast and sandwiches throughout the week, Trader Joe’s frozen nasi goreng and gyozas and tamales became fixtures during the frenetic misery of final exam revision. I have rabbitted on about them, and probably will rabbit on about them again. And yet, I wasn’t a total loss in the kitchen last year. I may have only been able to perform one small task, but I did it like a champ. 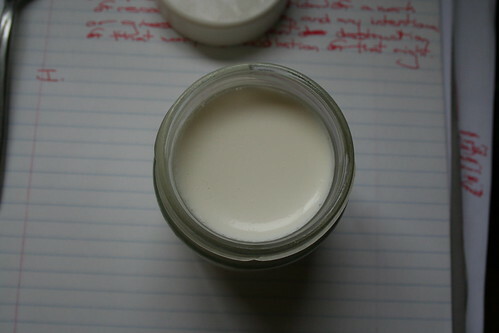 I have maintained a more-or-less constant supply of homemade yogurt in the refrigerator. Occasionally I’ll buy a tub of 2% Fage Greek yogurt, or some precious and outrageously expensive French organic yogurt at the Milk Pail Market in Mountain View (one of the most insanely fun food experiences you can have outside of the Reading Terminal Market in Philadelphia or the Strip District in Pittsburgh), but other than that, I’m never looking back. I’m sure it comes as a shock to no one who knows me that I have a lot of kitchen equipment, including a decent set of kitchen appliances. Since I have been an adult for roughly half my life, I’ve had plenty of time to suss out what is useful for me, and what isn’t. I’ve heard that the majority of owners of stand mixers don’t buy them to use them, but rather to have them sit fetchingly on the countertops of their meticulously appointed kitchens. I am mystified by the thought of treating a powerhouse appliance as, essentially, an expensive knickknack, but de gustibus non disputandum est, I guess. My commercial-model Kitchen Aid paid me back years ago what I paid into it, and continues to pay me back every day. I never thought I needed a food processor until I got one for free, from a friend who received it for a wedding present and didn’t take it out of the box for seven years. It is fabulous for making perfectly smooth hummus, and for shredding quantities of vegetables for fritters. (I’ve never tried it for bread dough, although I know people who swear by it, and if you even think of using it for mashed potatoes, well, don’t say I didn’t warn you.) And yet, even though the food processor is a workhorse, there are some mixtures which just work better in a blender than in a food processor—which is why I didn’t think twice about replacing my blender when the time came. These gadgets may look snazzy and impressive, but they earn their keep. Lest I give the impression that I’ll say that anything is useful, I point with some embarrassment to the juicer I bought at Woolworth’s right after Lloyd and I moved to Astoria. Try as I might, I couldn’t work up the enthusiasm to drink my fruits and vegetables, especially when I saw just how much fruit and vedge was needed to make a small cup of juice. Even Nigel Slater’s gorgeous and inspiring book Thirst didn’t move me, and the juicer went to a better home. In short, I am probably the last person who should acquire another appliance, and yet… I resisted the siren call of yogurt makers for years, supported by three arguments: 1. I lived in a neighborhood where terrific yogurt could be had for a song, from a shop less than fifty feet from my front door. 2. No modern fancy-shmancy yogurt maker could compare with the yogurt maker my mom had when I was a little kid. I was sure that without the heavy milk glass bowls that were a feature of Mom’s yogurt maker, the yogurt wouldn’t be nearly as good, and there was just no point in trying. 3. You didn’t need a yogurt maker to make yogurt. All you needed was a mason jar, a source of low heat (like a pilot light in a gas oven), milk, a little commercial yogurt for a starter and a set of foolproof instructions. Armed with instructions from several county extension agents, as well as from Laurie Colwin, I made a few attempts at yogurt, all of which tasted terrific but none of which set. I would like to say that I was finally moved to buy a yogurt maker out of nobler purposes, like wishing to crack the code on the ur-yogurt, or wanting to reduce the amount of yogurt packaging I sent to the recycling bin, but no, it was the always-cheering combination of vanity and groupthink that did it for me. The vanity came from reading French Women Don’t Get Fat, in which Mireille Guilliano waxes rhapsodic about slender women with perfectly-tied scarves having a little pot of yogurt to take the edge off their appetites. Apparently a lot of people had the same idea, because the King Arthur Flour Bakers Catalogue and Williams-Sonoma couldn’t keep them in stock. Eventually, though, I got mine, a seven-pot unit sold under the EuroCuisine brand, for about forty bucks. (The name may be silly, dear friends, but, like the other cast of characters in the kitchen, it knows its job and it does it well.) I bought some milk, plus a container of plain Dannon yogurt to use as a starter culture, and paint me yellow and call me a cab, it worked. The yogurt set. It was a little on the tart side, and it was a bit overcooked on the bottom, but otherwise, it was the yogurt for which I was looking. Over time, I fiddled a bit, experimenting with the amount of yogurt used to culture the next batch, the length of the cooking time (both on the stovetop and in the yogurt maker) and the variety of milk. I found that lowfat milk cooked down more than whole milk did, and that I had to start with more milk to compensate for this. Skim milk cooked down even more, and never really took on a good set. I found that whole milk yogurt not only tasted better, it left me fuller, and thus less inclined to eat too much of it, or of anything else. (WebMD has an informative, yet amusing, article about this. It touts yogurt as the “French Women’s Diet Secret” and quotes Mireille Guilliano as saying that yogurt contains carbs, protein and fat, “which are what you need in every meal,” but then only gives nutrition information for fat-free yogurt. The article also quotes WebMD’s “recipe doctor” as saying that yogurt is a great substitute for butter and oil in baked goods “because it adds moisture, volume and flavor without added fat or calories.” Okay, you’re not adding as many calories, or as much fat, as you would with butter, but even fat-free yogurt is not calorie-free. You’re adding calories.) I have not yet tried using goat’s milk, or sheep’s milk, but would jump at the chance to try both. Likewise, I have not tried using raw milk, which I can buy at the farmer’s market in California. This is mostly because raw milk is expensive, consigned to an occasional luxury, but also because I need to learn more about how it behaves. Part of the yogurt making process is to scald the milk, then to cool it down. I don’t know if raw milk will retain its flavor if it’s heated to scalding. There are alternative methods for thickening yogurt at lower milk temperatures: one involves the addition of nonfat dry milk to the milk being heated; the other involves using gelatin, which I really don’t want to put into my yogurt. What does all of this have to do with yogurt? Last week, I went to Safeway to pick up some milk for yogurt. I picked up a carton of Horizon whole milk and saw “ultrapasteurized” on the carton. For the love of Mike, I thought, Horizon is ultrapasteurizing *milk* now? Reluctantly, I picked up a carton of store-brand milk, wondering where the “pasteurized/homogenized” text on the carton was. Near the top of the carton, I found something else, in a smaller font: “Now tastes fresher longer!” That’s when it hit me: ultrapasteurization of milk is now the industry standard. I hasten to add that I’m not unsympathetic to the concerns of the dairy industry, or of the grocery business. The economy is not out of the toilet yet, and of course businesses—and consumers—want to minimize their losses. I hate discovering a carton of milk gone bad as much as the next person, and I really hate finding milk that’s gone bad before the carton has even been opened. But I don’t think it’s elitist nonsense to point out that ultrapasteurized milk, despite its superior keeping quality, does not taste like pasteurized milk, or, really, much of anything. You can certainly make yogurt with it. You can even make good yogurt with it. But, as with cheese, the better the milk, the better the yogurt. I’ve made yogurt from both pasteurized and ultrapasteurized milk, and I know which one I prefer. Trader Joe’s still sells pasteurized milk, and yesterday I was lucky enough to score half a gallon of Straus creamtop milk at this excellent grocery in my neighborhood. I’m going to keep buying it—and I’m going to let these merchants know that having this choice available is important to me. If it’s important to you, too, please, please communicate this to your grocers and your dairy. Here endeth the lesson. So we know why you make it and what you make it with, but Jen, what do you do with all this yogurt? I’m glad you asked. I eat a minimum of a pot a day, usually half with my breakfast and half late in the afternoon. If I know I won’t be eating lunch until after 2, I’ll have a whole pot at breakfast. I have used it as a substitute for mayonnaise in salad dressings—it is particularly great with Penzeys Green Goddess salad dressing blend mixed into it, along with a little cider vinegar and salt. I have also used it as a substitute for buttermilk in pound cakes and in cornbread. I have beaten it a bit to thin it out, added lime juice, cardamom and a little brown sugar, and used it to dress fruit salad. I have melted it into plain lentils. It is used to build a starter for one of my favorite flatbreads, from More Home Cooking by Laurie Colwin, an English-muffin-like griddlecake, flavored with black onion seeds (also known as black caraway, charnushka, nigella or kalonji). It is a terrific marinade for chicken and fish, and it also features prominently in rogan josh, a fiery, cardamom-rich lamb stew from Rajasthan. If you like Indian food, you can really go to town, yogurt-wise. One of my favorite cookbooks, Purobi Babbar’s Rotis and Naans of India With Accompaniments—which is something of a misnomer, as those “accompaniments” include drinks, vegetable dishes, meat dishes, sambars, chutneys, pickles, raitas and desserts—contains at least 50 recipes in which yogurt is either featured (lassis, raitas, yogurt sauces) or functions as a flavor-delivery ingredient (rotis, uttapam, dosas, the fabulous steamed bread known as idli, the equally-fabulous lobia, or blackeyed peas in gravy). Truth be told, I don’t know exactly how many of Mrs. Babbar’s recipes contain yogurt. I keep losing count because I keep getting distracted by how much I want to eat all this stuff, followed by a little dish of sweetened yogurt, enriched with saffron and pistachios. Or maybe I’ll abruptly shift cultures and turn the last of the cherries left over from last week’s pie into sour cherry borscht, which my beautiful friend Julie taught me to make, and then float a little yogurt on the top of it. Or I could cut up the rapidly-softening white nectarines I bought at the farmer’s market on Sunday, throw them into that hardworking blender, add yogurt and zizz until drinkable. Or or or...or I could just quiet down and eat it as is. Note: If I haven’t made it obvious by now, I’m a big fan of the yogurt maker. If, however, a new appliance is not feasible or desirable, and you want to try the mason-jar way, WebMD has the U.S. Department of Agriculture’s recipe here If you try it, do let me know how it turns out. Scald the milk over medium-high heat. When the surface of the milk looks a bit “puffy,” with tiny bubbles rising to the surface, and when a skin starts to form on the milk, it’s done. Pull it off the heat and set the pan on a trivet to cool down. As the milk cools, skim the skin (also known as casein) off the surface. While the milk cools, place the yogurt in a bowl big enough to accommodate all of the milk in the pan. When the milk cools to about 110F/40C—you should be able to keep your finger in it for 10 seconds—slowly whisk the milk into the bowl with the yogurt. Whisk it just long enough to incorporate everything. If you have a lot of foam on the surface of the milk, skim it off with a ladle. You will probably have a lot of milk solids sticking to the bottom of your pan. Do not scrape them into the milk/yogurt mix. Just throw the pan into the sink and let it soak. You’re done with it. Ladle the milk into 7 clean yogurt jars. If you don’t have a funnel, make sure you keep a damp sponge or paper towel close by. (Of course, you might not be hopeless at getting milk into jars without spilling a drop. If you are, feel free to point and laugh at me.) Place them into the yogurt maker in a ring of six, plus one in the center. Do not put the lids on the jars; that comes later. Place the cover on the yogurt maker, set the timer on the machine and turn the machine on. You can keep the yogurt warm for as little as two hours, or as long as 15. I usually opt for 12. When I cook it longer, the bottoms tend to overcook and separate, and I haven’t had the nerve to experiment with shorter cooking times. When the machine shuts off, cap the jars and refrigerate the yogurt for at least 8 hours before serving it forth.